Charing Chalk Pit is designated as a RIGS because it provides a key link between Middle Chalk RIGS in the Medway Valley (such as Bores Hole) and those on the Kent coast. It is the only remaining inland exposure of this important interval in this area of Kent. The site also has good educational potential. Charing Chalk Pit is an active site situated to the northwest of Ashford near the village of Charing. It provides a section through the upper part of the Middle Chalk. 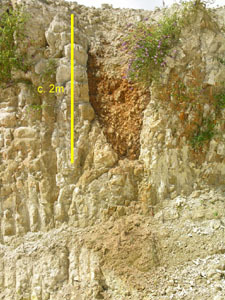 In the lower part of the quarry flintless nodular chalk with poorly developed marl seams and characteristic fossils is exposed. Above these wispy marls, flints appear and then, near the top of the accessible section, an excellent development of marl 10cms thick is seen. This is the Southerham Marl. Such marl bands and some flints (e.g. the Southerham Flint that lays 50cms below the marl) are used for correlation of chalk sequences throughout the Anglo-Paris basin. 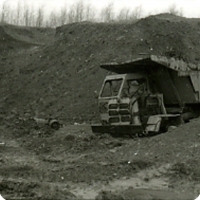 The site is an active quarry and all visits have to be properly controlled. Contact John Bourne & Co. Ltd. well in advance to make the necessary arrangements. Visitors will need to be properly inducted (advised of the potential hazards) and properly equipped (with boots, helmets, high-visibility clothing etc.). Access is relatively easy as road is adjacent but there is little parking whilst quarry operating. 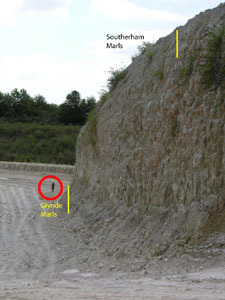 The quarry faces are vertical and hence there is the risk of falling debris, it is uneven under foot and large vehicular traffic and machinery are operating.